- The outside temperature is between -2°C to 35°C (28.4°F to 95°F). - The engine coolant temperature is not too low. If the ISG system does not meet the operation condition, the ISG system is deactivated. 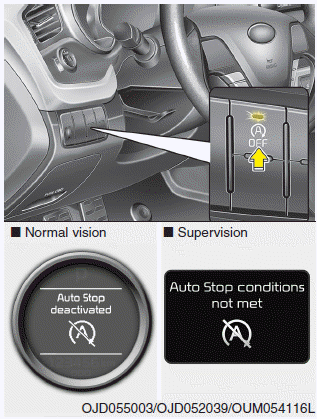 The light on the ISG OFF button will illuminate and a message “Auto Stop Deactivated” or “ Auto Stop conditions not met” will appear on the LCD display.